This is not the first time something like this has happened in Syria or elsewhere, Paul said, but now it is convenient to pay attention and react immediately. “From my point of view, there was no need to rush. There was no threat to national security. They have to give a reason to do these things,” Paul added. A factor that contributed to the speedy reaction was of course the US president, the politician told RT. 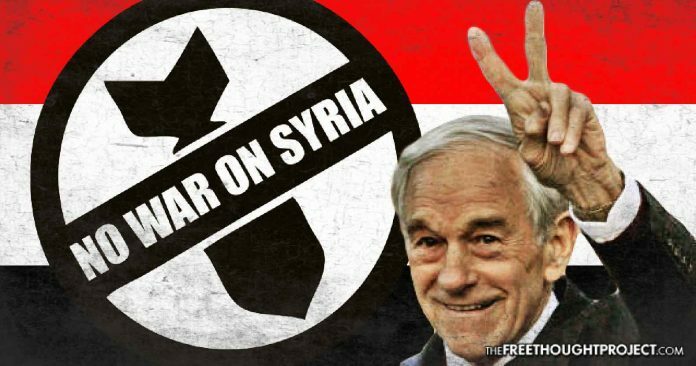 The Syrian situation now is “a victory for neo-conservatives, who’ve been looking for Assad to go,” Paul said. “They want to get rid of him, and you have to look for who is involved in that. Unfortunately, they are the ones who are winning out on this, and the radicals, too! There is a bit of hypocrisy going on here, because at one minute we say, well, maybe Assad has to stay, the next day he has to go, and we’re there fighting ISIS and Al-Qaeda. At the same time, what we end up doing is we actually strengthen them! It is a mess. This policy clearly does not lead to peace, Paul told RT. Last but not least, the politician spoke out about the deeper reasons – and potential disastrous consequences – of the latest attack’s timing. Some one find out more about thes White Helmets –that have Al-queda connection and to Soros. Do this group have connections to the Sarin gas. Did it come from Syria or Iraq in the former Husein reign.??? ?